In the last of Dr Charles Zuber’s tapa cloth series examining the exhibition Fiji: Art and Life in the Pacific, he asks the question: Has tapa become a quaint cloth or does it still have a significant role to play in the culture of Pacific communities? Research into art and design can take different trajectories. For example, the exhibition brings to bear the debates within their disciplines about the significance of the visual images collected, and the role that tapa cloths and other artifacts played in various societies cultural activities. The collections for this exhibition are self-conscious in the desire to compare works by Pacific Islanders to various canons of western art. There are comparisons to be made with tapas collected in the late 19th century to the work of modern 20th century abstract art and design – this is easy to understand when comparisons show similarities. This means that along with the anthropologists’ critique of the social, political and post-colonial ways of seeing, the aesthetic critique has been grafted onto the anthropologists’ interpretation. This is, effectively, another layer of signification that has been undervalued, and the curators work, more recently, has been to restore balance to the appreciation of what is now more clearly visible in these collections. Hence, the title Art and Life in the Pacific, and for another earlier exhibition in 2014 at MAA, the title Chiefs and Governors, Art and Power in Fiji are appropriate. There are, of course, many ways in which design issues can be relevant to both European and Pacific practice. In 2013, Air Pacific was rebranded and renamed Fiji Airways, and in doing so, sought to trademark over 16 designs for exclusive use. There was considerable indignation from the indigenous communities over what they considered was a kind of theft of what should belong with “locals”. Debates over these iconic designs became a legal battle that the airline never quite expected. Nonetheless, respecting cultural ownership of designs is an important issue for designers to consider wherever and with whomever they work. Within so called western cultures, questions might be asked, such as, is a certain design to be declared as open source or is protecting the patent or copyright more appropriate? This is not to say Fijian designers want to freeze-dry their culture, or allow traditional rights to be waived. However, it must be mentioned that in the exhibition there are young fashion designers who are in demand for costumes that combine tradition with experimentation. Examples of their work are shown as a special feature of the exhibition. Recently there has been a demand for wedding dresses by Fijian brides who want to have their costume made from traditional tapa cloth, but with a European design added. It is likely that hybrid designs will continue in the foreseeable future and that hopefully, the word ‘design’ might accompany the word ‘art’ in any future shows. Currently there are plans to turn this exhibition into a travelling show, and it would be great if this exhibition was to come to Brisbane. It would be of significant interest to our cultural institutions in Queensland. APDL wishes to acknowledge the assistance given to them by the organising committee of the exhibition Fiji: Art and Life in the Pacific. Many of the images in our Tapa article series were kindly supplied by the Sainsbury Centre for Visual Art, University of East Anglia, Norwich, and the Museum of Archaeology and Anthropology, Cambridge University. Cover image: Ceremonial bark cloth attire made on Nayau Island Courtesy Sainsbury Research Unit UEA. 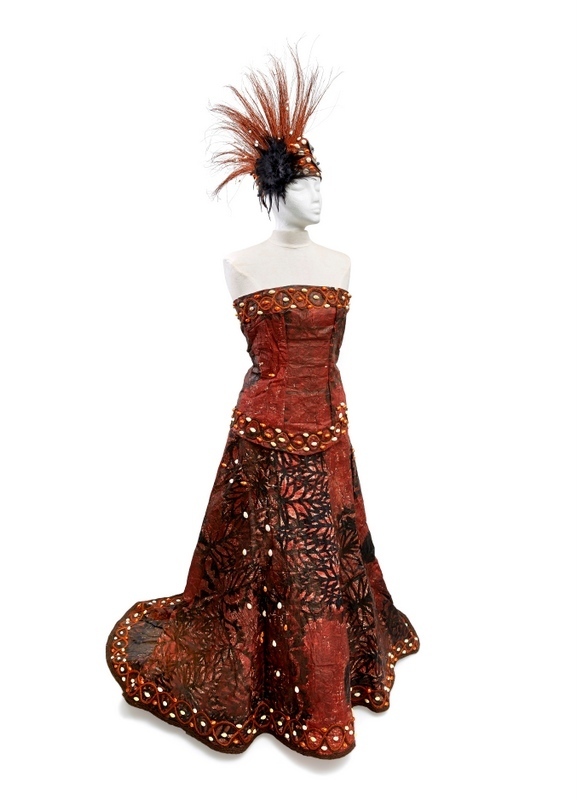 Photo credit 1: Hupfeld Evers Hoerder dress and headpiece. Courtesy Sainsbury Research Unit UEA.